x-coordinates of the M sample points ``(x[i], y[i])``. passing in a 2D-array that contains one dataset per column. the float type, about 2e-16 in most cases. information from the singular value decomposition is also returned. gaussian uncertainties, use 1/sigma (not 1/sigma**2). If full is True, then cov is not returned. coefficients for `k`-th data set are in ``p[:,k]``. deficient. The warning is only raised if `full` = False. 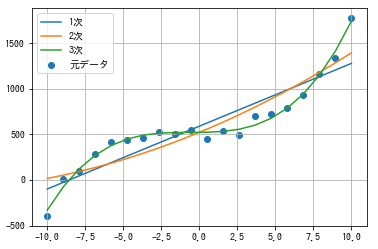 polyval : Compute polynomial values. linalg.lstsq : Computes a least-squares fit. 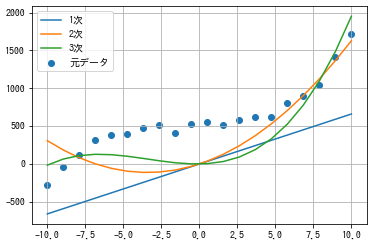 scipy.interpolate.UnivariateSpline : Computes spline fits. The coefficient matrix of the coefficients `p` is a Vandermonde matrix. values can add numerical noise to the result. msg = "Polyfit may be poorly conditioned"
#  (which is implied by a Bayesian uncertainty analysis) includes it. #  Plus, it gives a slightly more conservative estimate of uncertainty. raise ValueError("the number of data points must exceed order + 2 "